March to demand our right to health: health care for all, education, housing, a living wage, clean air, clean water, healthy food, and the right to live a life free of discrimination, exploitation, oppression, and violence. That means standing up to the profit motives of private health insurance, pharmaceutical companies, developers, gun manufacturers, and fossil fuel companies. Broadway and 14th St, Oakland. We need improved Medicare for all now. The U.S. is one of the only countries in the “developed” world that does not guarantee universal health coverage. We pay more for health care and have worse outcomes because the system isn’t built to take care of people, it is built so that private health insurance and private pharmaceutical companies can make more and more money. Private healthcare in this country is bad enough, but Trump and the GOP are on a mission to make it far worse through cuts to the ACA, Medicare, and Medicaid. We need these programs, and much more. Medical illness is the number one cause of personal bankruptcy in the U.S. There are 4 paid lobbyists for every single congressperson in Washington DC and health industry lobbying spending continues to rise as the expectation and discussion of healthcare and medicare for all grows. Both Republicans and Democrats at the state and federal level take millions from those who profit off of the sickness and suffering of US residents. The private health insurance companies don’t want to pay for the health care we need because it would impact their profits. It’s time to get private profits out of Our Healthcare. In California, the Democratic Party has a supermajority, which means that they can pass any law they want. They control the Senate, the House, and the Governorship, but they have shelved SB 562, the bill that would guarantee healthcare as a right for all California residents. We need independent corporate-free representatives who will unapologetically support single payer healthcare. A Healthy life means fully funding public education. Education improves public health and health equity. Unfortunately, there are vast disparities in funding for public education because of the mechanisms of funding and the greater inequality in the US as a whole. Public schools are poorly resourced by property taxes, which accounts for the vast disparity in public education resources in a high income area compared to a low income area. Additionally, public education is currently under attack by private corporate interests. We need to fully fund public education by putting teachers and students first. Fair pay for teachers and small class sizes are good for teachers, students, and parents. A Healthy life means a living wage and a place to live. That means enacting a minimum wage that is a living wage, a wage that allows us to purchase healthy food and afford to live where we work if we want to. 3 men in the U.S. have more money than half of the US population, over 160 million people. Corporations don’t want to pay workers a living wage because it would impact their profits, but they wouldn’t be able to make that surplus without profiting off of the real value that the workers’ create. Developers don’t want rent control and affordable housing because it would impact their profits. There are currently over 500,000 unhoused persons in the US at this time and there are more vacant houses than unhoused people. A Healthy life means breathing clean air, drinking clean water, and eating healthy food. West and Downtown Oakland residents have some of the highest asthma rates in the country, and have higher stroke, heart failure, stress, and diabetes rates than other areas. The higher air and environmental pollution exposes people living in these and other environmentally polluted areas of the Bay Area to worse Health outcomes than higher income communities in other areas. Fossil fuel companies, including the 5 corporations that have oil refineries in the Bay Area, do not base their decisions around the health of human beings or the environment. They exploit our resources and pollute our communities in search of greater profits. In fact, developer Phil Tagami is suing the city of Oakland on behalf of coal in Utah, which will significantly worsen the quality of air in West Oakland. Coal is the dirtiest fossil fuel on Earth — it damages the health of workers, endangers frontline communities, and contributes greatly to greenhouse gas emission and climate change. In the Oakland flatlands, where the median household income is $32,000, there’s an average of one supermarket per 93,126 residents, but in the Oakland Hills, where the median household income is over $58,000, there’s an average of one supermarket per 13,778 residents. Developers don’t care about people eating healthy food, they use their power and influence to increase their personal profits. Oakland has a deep history of working people organizing for food justice, like the Free Breakfast for Children Program started by the Black Panthers in 1969, but vast inequities remain due to the current overarching economic and political system. A Healthy life means a non-toxic environment. In Bayview-Hunters Point, San Francisco – home to one of San Francisco’s last strongly populated African American communities – a recent investigation found that almost half of the soil samples taken from the cleanup at the heavily polluted shipyard were suspected of being tampered with or falsified. Serial offender Tetra Tech, tasked with the cleanup, continues to be consulted in environmental cleanup projects around the Bay Area, including on Treasure Island. Developers and politicians remain willing to push these redevelopment projects through rapidly in pursuit of higher rent and profits, while toxic and radioactive chemicals continue to be an environmental hazard for our health. A Healthy life means living a life free of discrimination and oppression. Institutionalized discrimination and oppression lead to economic inequality, higher stress, worse health outcomes and shorter life expectancy. People of color face significant disparities in healthcare. Even when socioeconomic status is the same, pathogenic factors linked to race continue to affect health. Before the ACA, women were charged up to 50 percent more for monthly private health insurance premiums then men. As recently as 2016, women were paid on average 20% less than men. Latinos are 3 times more likely to have no healthcare and increasing ICE raids and deportations have a negative affect on physical and mental health outcomes. A Healthy life means living without the fear of being gunned down in your own community. Gun homicide rates are 25.2 times higher in the US than in other high-income countries. On an average day, 96 US residents are killed with guns. In the past 5 years there have been over 240 school shootings in the US. Mass shootings are getting deadlier and the majority of mass shootings use the AR-15 assault rifle. Black men are 13 times more likely than white men to be shot and killed with a gun. On average there are 13,000 gun homicides a year in the US, and almost 1000 of those are fatal police shootings. People of color are disproportionately more likely to be shot and killed by police and unarmed black men are often shot and killed by police, sometimes in their own homes. Our Health needs are at odds with the profit motive of private health insurance, pharmaceutical companies, developers, gun manufacturers and fossil fuel companies. Stop Trump’s Attacks on Our Health! Fight cuts to the ACA, Medicare, and Medicaid. 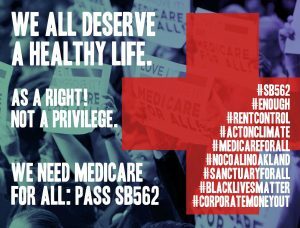 Release and pass SB 562 in California as a step towards nationwide Medicare for All. Fully fund public education by putting teachers and students first. Fair pay for teachers and small class sizes help teachers, students, and parents. Enact living wage laws, rent control, and publicly fund affordable housing. Fight Climate Change and Environmental Pollution! For a mass green jobs program to invest in renewable energy to replace fossil fuels. No More Institutionalized Racism and Sexism! Halt all deportations, full legalization for all US Residents, equal pay for equal work, equal opportunity for all regardless of ability, race, or gender. Full sovereignty to Indigenous peoples. Ban assault weapons, mandatory background checks for all gun purchases, demilitarize our communities.